In case you hadn’t guessed from the title, we have a new website. And we’re just a *little* bit excited about it! For a while now we have been moving away from our rouge niche and embracing all colours across the spectrum; and we wanted our new website to reflect this. Switching from our old site was both a daunting and thrilling prospect, but we think you’ll agree that the result is pretty darn awesome! The new design nicely sets out our stall as a vibrant and innovative company, which stocks colourful and contemporary home accessories and gifts. But it isn’t just a fresh (and rather fetching) face… it also comes with some pretty handy features to help you find the perfect product. You. Are. Welcome.! You can now use advanced filter options, search specific categories of gift, search by style, and search by room and colour – as shown below! Once in a category, you have a wealth of advanced filter options at your disposal, including the option to filter by price, brand, colour and style. You can also narrow down the products using the Category tab – for example if you’re in the Kitchen Utensils category, you can select sub-categories such as Cheese Graters or Knife Blocks. You can now search by different categories of homeware styles, including Scandi Style Homeware, Industrial Style Homeware and Retro Homeware. We have expanded our gift categories from the rather limited ‘Gifts for Her’ and ‘Gifts for Him’ to include categories such as Keen Cooks & Bakers, Coffee & Tea Lovers, Animal Lovers and Bookworms. You can also now search by room or colour, to help you find a product which is just the ticket for sprucing up your home. Handy. Our new tagline ‘Shut up, beige!’ perfectly encapsulates what Red Candy is about: we’re a buzzing company with a fun ethic but we’re deadly serious about sourcing only the coolest and most innovative products from all over the world. The colour beige is boring, and so it has no place on our website. End of! 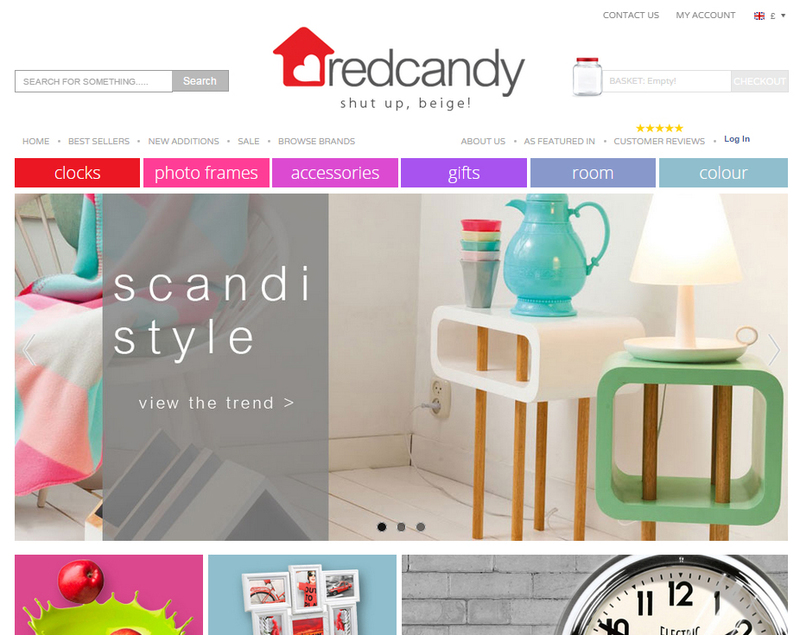 We haven’t sold exclusively red products for a few years now, and our customers know that although we are called Red Candy, we are the place to come for design-led products in oodles of bright and beautiful colours. After all, last time we checked Apple wasn’t famous for selling, erm, apples! So please do check out our new website, and tell all your friends! And don’t forget follow us on social media for new products, weekly competitions, and office antics!